Roof design is an important factor in designing shade structures, obviously. It can have a significant effect on the overall look and design as well as the initial, long term performance and maintenance costs. 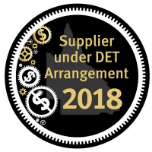 Skillion roof design tackles a lot of these requirements. 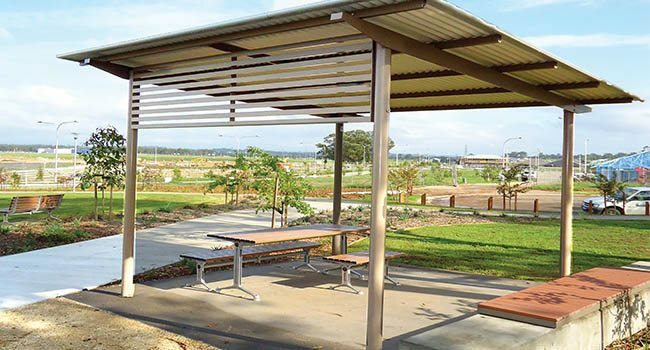 Skillion roof refers to a single-sloped or mono-pitched roof design, it has now become a popular design feature in Australia for different structures given its contemporary and minimalistic aesthetics that blends with most surroundings. 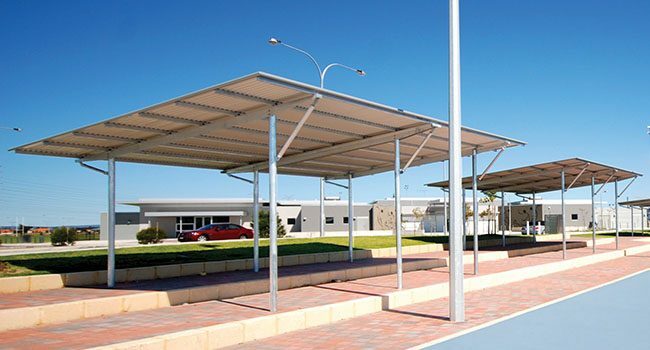 The high-pitched one side design provides excellent shade throughout the range of the suns daily path which is good for all Australian locations as the roofs shadow doesn’t move greatly. This design also allows for a single path of water to the back lower edge when raining and therefore the flow can be controlled easily to one side, into a garden or one single gutter and down pipe for easy and exact water flow location. Using a Skillion design is a low cost roofing choice since it uses a low amount of materials, has virtually no cutting and no complexities, and since it is single-sloped, it is easy and fast to construct. It is customisable by adding in screen panels, through posts and decorative corners and the like which can also give your structure a unique appeal. 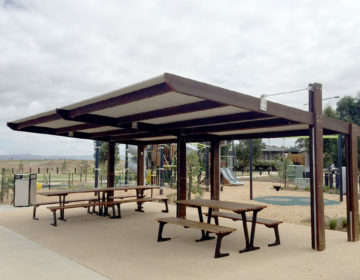 Landmark has a wide range of products built with a Skillion roof design. 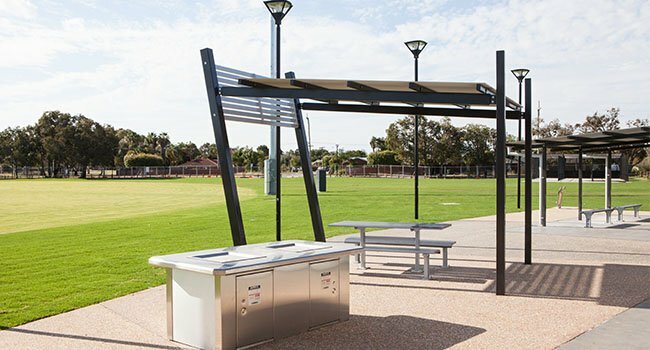 One of these is our flagship product range of K630 Whyalla All-Steel Park Shelters. 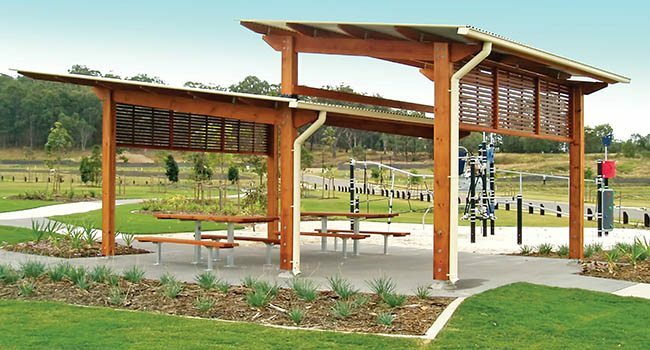 This range offers a minimalist design in an all-steel construction suitable for any park or urban environment. We also have Skillion roof designs using timber and aluminium. 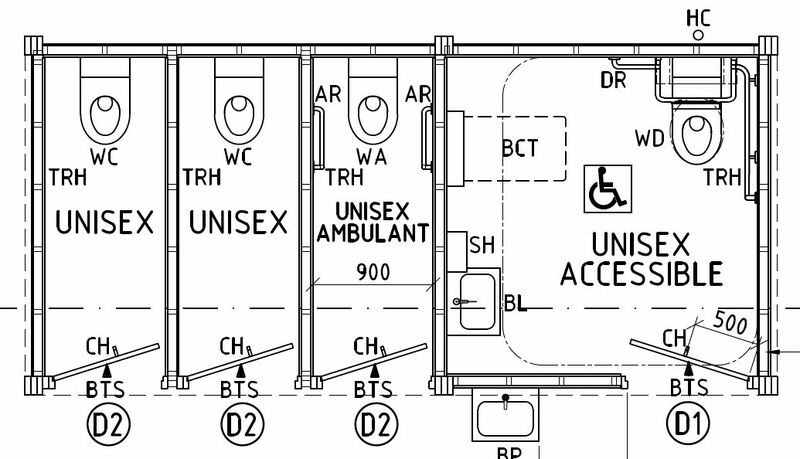 All our shelters are supplied in flat pack kit form complete with step-by-step installation instructions and professional building application drawings approved by third party engineers.